There is much a person can use Barrels to accomplish. Steel, Plastic, Large, Small, they are all very useful and on some farms and ranches, a person could not be without them. This page is dedicated to keeping barrels out of the trash pile. To letting you know how useful they really are. To give you an idea of things you can use Barrels for. However, this is a copyrighted page. Please do not take this information and pretend that it is your own. 1. 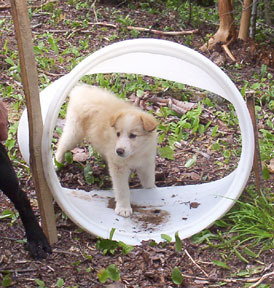 Barrels have so many uses with animals and animal training. This is Milo coming through his first Agility Course Open Tunnel. It is of course a 55 gallon Barrel cut in half. 2. The other half of Milo's 55 gallon became a feeding bowl for our goats. 3. Of course, it seems, EVERYONE KNOWS that Barrel Racers need Three, preferably 55 Gallon Barrels, set up to train and to compete with their horses. Fastest team around the three barrels in a clover leaf pattern, wins. 4. Barrels cut in half, either long ways for across the middle in a standing position can become feeders for livestock. 5. Or cut in half can be water holders for animals. 6. Or cut in half can be a swimming pool for ducklings or goslings or even ducks. 7. Horses are not the only animals that race around barrels. I have a website called Barrel Racing Dogs (check over in the sister sites to visit that site). This is Frankie, our little Cocker Spaniel that does it all, training, for the first time, on Barrel Racing. 8. 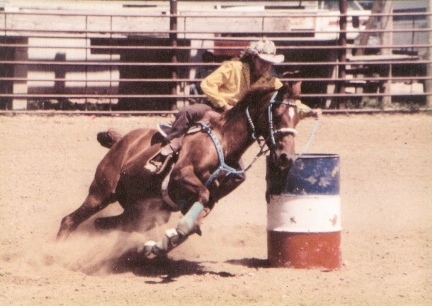 Any animal can be taught to run barrels with or without a rider. Set up three and start training. 9. Of course you might put holes into a steel barrel and use it for burning trash. 10. A barrel could be used for composting. 11. We use clean 35 gallon barrels for bringing home water. We have lids for the holes and it works great in the back of the pick up truck. We have carried as many as 6 at a time. 12. Deron has cut the top off more than one barrel and we have used it to store animal feed in. Of course the barrel was clean and we use a piece of plywood for the top to make sure it stays closed. You could not do this of course if you store feed in an area your animals can get into. Larger stock would knock the lid off and help themselves. 13. Cut the lids off to catch rain water. Set under a hanging roof will gather more than if just left to catch out in the open. 14. Or use a hose of some sort at the end of your gutters to funnel the rain water into the barrel. 15. Set on a shelf, or second story, if you do not have running water, and use a hose inside the barrel for running water into a sink or bathtub. 16. Paint Black and store water in the sun within and you will have warm water (Spring, Summer and Fall). 17. Cut in half and use for planters. 18. Fill with dirt and place a mailbox on a pole in it if you can not dig out and set your mailbox. 19. Barrels can be used for blocking off gates. 20. 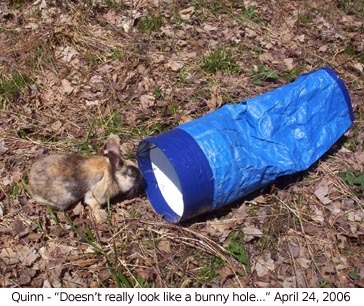 A smaller barrel can be cut at both ends, taking the ends off, and decorated to become an Open Tunnel for a small dog, a cat, rabbit, or other small pet. Yes. Rabbits and other animals do enjoy agility, have a look at our other sites set up for just that on the right side of the screen. 21. You can cut a barrel, each end off, to make the opening for a Closed Tunnel for an Agility Course, size of the barrel will matter for the type of animal it it for. 22. Filled with sand, stood side by side, a fence could be made. Or a Round Pen for smaller animals. 23. A half barrel, a barrel cut in half, could become a bathtub for a small dog or other small pet. 24. If you have the lids for the barrel, you could store grains or rice or beans for humans in a very cleaned out and dry barrel. 25. Cut the top off and clean out a plastic barrel and use it for hand washing your clothing. 26. Haul dirt in open topped barrels from one area to your garden for good top soil. 27. If you wanted a coffin for an animal. I highly recommend however, letting their bodies break down into the soil as God intended. 28. I use a 35 gallon barrel for my Cocker Spaniels to stand on while I groom them. It is the perfect height for me, gives them enough room to stand, but no room to move around. 29. Use a broken or leaking barrel for target practice, with or without Targets tacked or painted on them. 30. 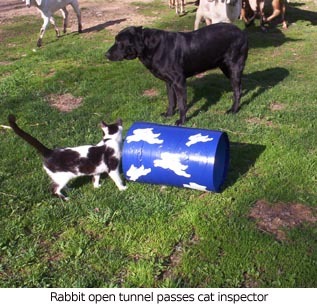 Teach a dog, goat, or other small animal to "Walk the Barrel". I have training information to do just that on our Dog Star Kennel website, see sister sites at the right of this page. 31. Cut a couple of barrels down to about 12" and you have two sinks to wash and rinse dishes in. 32. Grow trees in a barrel while they are small. Do this in your fenced in area if you have goats or horses or llamas or..... so that the saplings do not become eaten before they have a chance to be a tree. 33. Cut a barrel longways and make a shield for yourself or for a Costume. 34. Use a barrel as a table or bench in your home. 35. 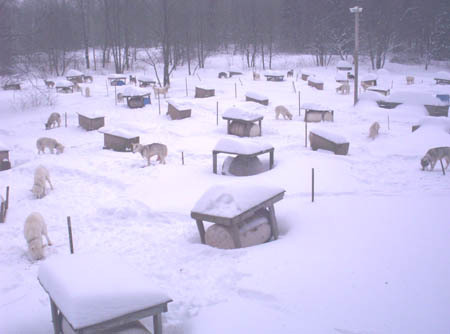 We built frames for 55 gallon barrels to make doghouses for our Siberian Husky Sled Dogs, most preferred to sleep in the snow. <sighs> I used wood from free wooden pallets. I later added siding to each of the houses. Working dogs need house for protection from the elements. If they use them or not, their choice. But each and every working dog should have a house of their own. 36. We also cut barrels down to fill with water for Summer months for our dogs. We set a 1/2 barrel between each two dogs. They could drink from it and or get in it. Our labs loved it, our Siberian's, just drank from them. 37. Water Storage, water storage, water storage. Clean Barrels with lids do not just catch and deliver water, they also can be used for storage of water. Have many filled and available. 38. Cut the lid off and use for a cooler to hold ice and drinks at a Bar-B-Bue or Picnic. Make it tall enough that children can not just reach in and help themselves but have to ask for help. This will cut down in waste of soft drinks and sugar filled brats. 39. Make lids for Barrels with four cuts of a 2" x 4" screwed to a plywood cut over sized. Screw the 2" x 4"'s to the plywood upright. Upright gives you more of a lip that will keep the lid on better and more secure. 40. Mount on a wall in the barn and use for a Saddle Stand. 41. Cut the lid off and mount on the wall of your Horse Trailer for a Saddle Stand with an area for other tack and your groom supplies. You might add a board in the bottom of the barrel for a flat surface with more area for storing. 42. Cut holes or windows into the front of a barrel. Add wooden shelves for a good storage area in your barn or garage. 43. Cut the lid off and add a wooden lid with a lip and store out of season clothing in your garage and or barn. 44. Make a snug 2" x 4" frame for the/a lid and add a larger sized sheet of plywood (not much larger than 3' square) and you have a table that can be used for all types of events. Leave the lid intack when you make this table and the barrel can be used for other uses as well as the table. Store the lid, when not in use, off the barrel. 45. Cut out and make a frame for a chair with a head rest. Add a wooden seat and on top of that, a cushion. You could store items under the seat. 46. In a pinch, a few barrels could be the "fence posts" with wrap around chicken wire. If you were to use this pen for chicks or small animals, make sure you do not have predators of you may have just made a trap for the predator to be able to catch your smalls easier. 47. Fill with sand and use as a wight to hold down steel for a building you are getting ready to work on. 48. Use two for "saw horses" when working with tools and or building. 49. Cut a barrel in half. Cut a sheet of plywood down to about 2' x 6'. Use these items for a child's Lemonade Stand. 50. Use four barrels with one full sheet of plywood for a table at your next Garage Sale. Be careful what you display on this table. 51. Use four barrels and one full sheet of plywood to make a serving table at your next Bar-B-Que. This would not be a good place for children to sit around. But with the highth parents would have to help the kids get their food. Much less waste this way. 52. Use a Clean Empty Barrel with one of the lids open in your shooting range to place shell into. Think of how many shells this will hold for reloading. 53. Cut the top off barrels to make trash cans. 54. 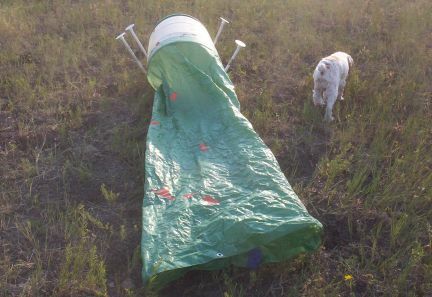 Use four barrels with lids on their sides to add a piece of plywood to by drilling holes into the plywood and tying on, with heavy rope, to make a raft...not suited for rivers or other fast moving waters. Just for fun at the Lake maybe. Boy Scout Project. Wear life preservers when riding this raft. 55. Cut out both ends and add suspenders and you have an outfit. Great, with clothes underneath, for a Costume. 56. Cut out both ends and add suspenders and wear it to take an outdoor bath. 57. Cut the barrel long ways, leaving the ends on. Build a holder, the height for your animals, different for goats, or llamas, or horses, or miniature donkeys, ect., to make a manger in or out of the barn. This is best used, with the taller animals, attached in the back or at the ends, to a wall so that they do not knock it over while eating. 58. Cut a barrel long ways, build a stand for it. Place water and fish in it. Let kids catch dinner for the family. 59. Cut a barrel long ways, build a ground stand for it and use it to water animals. 60. Cut the lid off of a Metal Barrel and add a grate, make a Bar-B-Que Pit. 61. There are ways, not room to explain it all, to make Meat Smokers out of Metal Barrels. 62. There are also ways to make Solar Ovens out of Metal Barrels also. Look these up with an Internet Search. I do not have space here to explain it all. 63. Give one or two clean barrels to a couple of kids out in the yard....watch the fun. 64. You could cut the top out of one and use it to collect items for people, like toys for kids at Christmas, food for the lazy, or something very useful, items for the true homeless having a hard time with life through not fault of their own. 65. Cut the top out of a Clean Plastic Barrel and use it for your children to keep toys in side of. 66. Cut the top out of a Clean Barrel, make a secure lid for it out of 2" x 4" and a small piece of plywood, use it to hide Gifts in, especially Christmas Gifts bought through the year (on sale of course). Leave this barrel in the barn or garage. 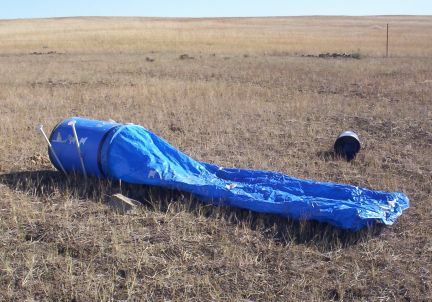 You could even wrap the gifts, put the wrapped gift into a plastic bag (to keep the dust off and so that you could not see it IS a gift) and put them in the barrel. Make sure breakable or crushable items are always 'floated' to the top of the barrel, heavier items to the bottom. 68. Set the barrel on it's side, make a sturdy floor stand for it. Cut out a 'hatch' in the side of it. File it or sand it so that there are not sharp edges. Duct Tape a large piece of stiff Space Ship or Outer Space Print Fabric to the hole. This will make your barrel a 'Spaceship'. This will make a really fun item for a child to spend many hours in. To stiffen your cotton based fabric, back it with a thicker fabric, quilt like. 69. See number 68. Use the same barrel on it's side, with the hole in it, on a study stand for a dog or cat bed. Add a pillow for them to lay on. 70. Low on cash? Need a bed frame? Use six barrels, 35 gallon will be best, and set them as legs would be under a bed frame. Set a piece of thick plywood over the barrels and add your mattress. This now give you a place to hide/store many items packed in storage tubs under your bed, and with easy access to them. 71. Place an empty clean barrel, preferably plastic, in the back of your garage or in your barn. Use one with the little lids that are still working well. Each week put an amount of money, using change, into the barrel. Leave it there and watch it accumulate. Leave it unless you REALLY need that money. NEED, not want. One day you will have a nice little "nest egg" there in that barrel. And no one will ever know it is there, unless you tell them. 72. Fill several clean plastic barrels with water (you will need the screw on lids for the water to remain usable for humans) and make a windproof wall for your home and or barn. This way you will have water stored and keep your home warmer in the winter, using less energy to heat it. 73. Teach your equine to push an empty barrel with it's nose as a trick. 74. Use one of the lids from a barrel you have cut it off of as a Pedestal Training Prop for an animal to learn to go to and stand on. 75. Cut the lid off a barrel and store wrapping paper rolls in it. 76. Use barrels to block your driveway when you resurface or when your M-I-L is expected. 77. Use for to block a gate until your gate is finished drying from painting it or repairing it or until you purchase a gate. 78. Cut the lid off a barrel and place it in your Shooting Range. After you have shot up your plastic bottles filled with gray water, pick up the shot up bottles and recycle them. 79. Cut another barrel and set it in your Shooting Range for the shot up cans for recycling. 80. If you are small enough, cut the lid off a barrel and hide in it. You can pop out of it and startle people, just for fun, or hide in it and take photos of people leaving trash on your roadway, messing around your property, or whatever you might want photos of. 81. Set up a barrel at the end of your driveway that has a cut out to hide a security camera within. You will know just who or what came by while you were away. 82. Cut a barrel, not necessarily in half, but to the height you would like for your dog or goat to use as a pedestal for trick training. Decorate it for more fun. Use the other half for a planter or waterer for livestock. 83. Cut a barrel into hoops that are about 2" wide. Take these, filed and sanded, and hang them from posts (as seen in the photo where I used hula hoops but wanted this photo to show you what I am talking about here). Train your dog or other smaller animals to jump through it as an Agility Piece on your Agility Course. 84. Take the ends off of a barrel and cut the centers out. 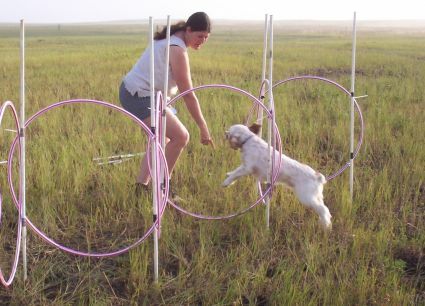 Use a a Hula Hoop for a dog or small animal to jump through. 85. Cut the top off of a barrel and use it to store fence posts within. You might want to take the lids off the other end so that water/rain/snow drains out. 86. Cut an end off a barrel, place it in the back of your truck or on a wagon or in a wheel barrel. Use it to place trash in as you pick it up after a wind storm or what stupid people throw out near you. 87. Place clean empty barrels in a wagon for your goat to pull as you use it to take water out to your livestock. 88. A Chariot could be made, with care, for a goat to pull, using a barrel and adding wheels and shafts. Miniature Donkeys pull these also. 89. Using the barrel on it's side, add four wheels, cut out the side of the barrel, add shafts, and make a wagon for a dog or goat to pull. 90. Cut correctly and adding wheels and a handle, a barrel could be made into a Wheel Barrel..... I am convinced that the name and idea of our modern Wheeled Barrels came from someone doing just this. 91. How coordinated are you? Do you have good balance? Add carpet to the sides of the barrel, wrapping it in carpet that is, and learn to walk it yourself. I would highly recommend no alcohol to be a part of this sport. 92. At a Bar-B-Que have several barrels the same size. Mark the ground and have a barrel race. Set the barrels on their sides and have the people either get down on the ground on "all fours" and push the barrel with their heads, or stand and use their feet, trying to keep the barrel in a straight line as they push it to the finish line. 93. Use a barrel for a placement of a bucket with dirt or sand in it. This would be in an arena for a Horse Event or practice. Have a Flag with a 3/4" - 1" dowel to pick up on the first round, and set back in the bucket on the second round in a timed event. 94. Use at a 4H event to play Goat and or Llama or Equine games. The ideas are endless. The barrel may be nothing more than the item to run down to the other end of the arena and go around before coming back to the finish line. 95. Excersize Marker. Set up a barrel about 1 block from your front door (if you live way out that is). Use it to walk to and back from for excersize. Send the kids to run out and run around the barrel and back. Move the barrel further and further out as you get used to walking the short block. Soon you can bring the barrel home and just walk as far as you would like.... but the kids may want you to leave it so that they can race around it and back. Also a good game at a Bar-B-Que for kids and adults. 96. Pad the bottom of a clean barrel without a lid and store your bow and arrows within. 97. Use a clean barrel, preferably with a lid, to store a man's hat collection in. 98. Use a clean barrel, preferably with a lid, to store a woman's many purses within. 99. Teach yourself to lay on your back, legs in the air, and roll the barrel around with your feed.....you might want a fencing mask when you first start this. You may also only want to use a plastic barrel for this. It will make the favorite video site for sure! 101. And when you are finished with your barrel or the item you made out of your barrel. Do NOT throw it away. If it is still in good repair, someone will want it. Someone will want it for what it is or to make it into something else, if even just to use it for a shooting target. The contents of this page for 101 Uses For Barrels is still under construction. Please check back later!